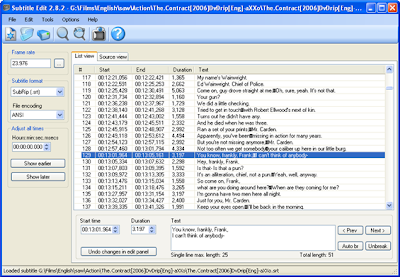 Subtitle Edit 2.8.2 programs through which we can create or edit subtitles for movies. The program has many features to facilitate the work of, in the latest version, we can translate the entire text using the Google translator. Subtitle Edit 2.8.2 is a powerful data subtitle, ideal for those who enjoy translating their favorite movies and series as well as for those who need only edit files by length and spelling. With Subtitle Edit 2.8.2 you can create subtitles from scratch, transform, edit, correct and refine existing ones. One of the most interesting options is the one that shows the sound spectrum of the video so you can adjust subtitles as closely as possible. "I work with multiple documents. "Integrated video player that works with GStreamer. "Preview in external window, thanks to its integration with Mplayer. -Allow to separate and unite subtitle files.